Is it a cactus? 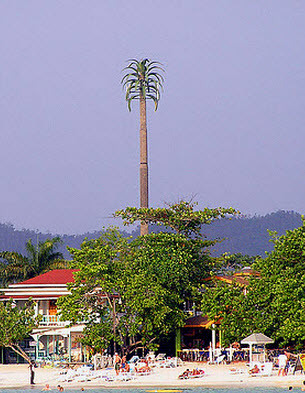 A palm tree? A water tower? No It’s a cell phone tower That’s right Cell phone towers today are being disguised in subtle ways unheard of just a few years ago. See a grain silo? Or a church steeple? You guessed it. It could very well be a cell phone tower. There’s even a cell phone tower that looks just like a lighthouse.never mind that it’s over two miles from the ocean. But don’t let the pretty and ingenious disguises fool you. There is a real and present danger lurking behind the mask of these innocent designs. Why the disguises? Obviously, for aesthetic reasons. The cell phone companies don’t want to make their neighborhood friends upset. They want to blend in. So they blend in while they blast your home and neighborhood with toxic electromagnetic radiation. 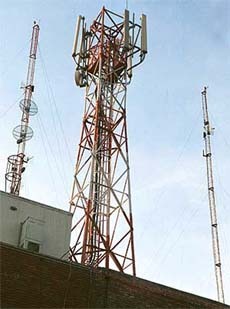 Cell phone towers, sometimes called masts, or mobile phone towers, weren’t an issue years ago when they were few and far between. One could often drive miles and miles through the countryside and never see one. They were few in number and were only found in obscure locations and seen only on an occasional hilltop. Today cell phone towers have increased dramatically in number. There are now more than 1.9 million cell phone towers and antenna towers spread throughout the U.S. They are now found on churches, schools and firehouses as well as being seen on the rooftop of buildings everywhere. Did you know there is even a cell phone tower near Old Faithful in Yellowstone Park? Can’t sleep well at night? It may be that there’s a cell phone tower close by. Unfortunately, there isn’t much one can do to stop the proliferation and continued build out of cell phone towers and structures. 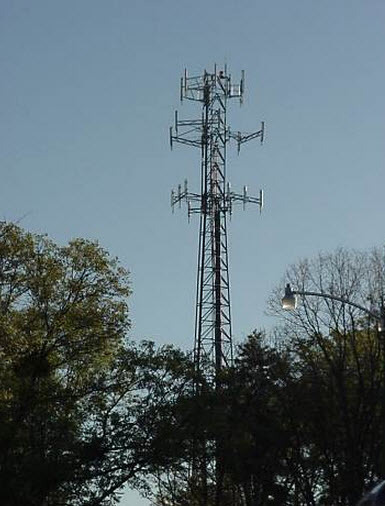 Although thought to be legislation about deregulation issues, the Telecommunications Act of 1996 (TCA) was really an open invitation for the cell phone industry to place their towers anywhere they wanted. Section 704 of the TCA basically states that local authorities can’t ban the placement of towers in their jurisdictions. The law says: “No State or local government or instrumentality thereof may regulate the placement, construction, and modification of personal wireless service facilities on the basis of the environmental effects of radio frequency emissions to the extent that such facilities comply with the Commission’s regulations concerning such emissions.” So legally the local government can’t refuse the construction of a cell phone tower in your neighborhood Any challenge by local communities could easily end up in federal court. Our lawmakers have basically given the cell phone industry free reign to install these towers wherever they want. And, by the way, the cell phone industry helped write this legislation that our government officials passed as law The public, therefore, now has no voice and no vote. Is there something wrong with this picture? Why didn’t our public officials represent the people instead of big business? Why would you let the very industry you’re trying to regulate write it’s own laws? Does the income outweigh the potential risks? It appears not. Scores of studies and well-respected research have exposed alarming health effects from various forms of cancer to stress. Many experts today are predicting an epidemic in brain cancer soon. Cell phone towers emit signals in a “flower petal” pattern around the tower. This 360-degree radius around the tower is called a “cell” and this is what the term “cell” in cell phone means. When your phone is in a “cell” you get good reception and when it isn’t in a?”cell” you get poor reception. So, for a cell phone company to provide complete coverage cell phone towers and antenna towers must be positioned all across the country so that the “cells” overlap. You can begin to see what a huge infrastructure needs to be created to provide complete cell phone coverage. That’s why cell phone towers and antenna towers are so prevalent. Furthermore, that’s why these antennas are installed in so many places like rooftops, fire stations, schools and churches. This is what is necessary for complete coverage. Santini et al. 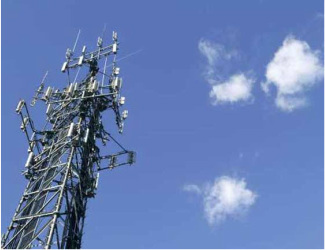 found significant health problems in people living within 300 meters of a cell phone base station or tower. The recommendation was made from the study that cell phone base stations should not be placed closer than 300 meters to populated areas. Pathol Biol (Paris) 2002; 50: 369-373. A Netherlands Organization for Applied Scientific Research study entitled, “Effects of Global Communications System Radio-Frequency Fields On Well Being and Cognitive Function of Human Subjects With and Without Subjective Complaints” found significant effects on well being including headaches, muscle fatigue, pain, and dizziness from tower emissions well below the “safety” level. Gerd, Enrique, Manuel, Ceferino and Claludio conducted a Spanish study called “The Microwave Syndrome” and found adverse health effects from those living near two cell phone base stations. The health effects included fatigue, a tendency toward depression, sleeping disorders, difficulty in concentration and cardiovascular problems. From an Israeli study published in the International Journal of Cancer Prevention, Vol. 1, No. 2, April 2004, Wolf and Wolf reported a fourfold increase in the incidence of cancer in people living within 350 meters of a cell phone tower as compared to the Israeli general population. They also reported a tenfold increase specifically among women. In the Naila Study from Germany, November 2004, five medical doctors collaborated to assess the risk to people living near a cell phone tower. The retrospective study was taken from patient case histories between 1994 and 2004 from those who had lived during the past ten years at a distance up to 400 meters from the tower site. The results showed that the proportion of newly developed cancer cases was significantly higher in those patients living within the 400-meter distance and that the patients became ill on average eight years earlier. In the years 1999 to 2004, after five years of operation of the transmitting tower, the relative risk of getting cancer had trebled for residents of the area in the proximity of the installation compared to the inhabitants of Naila outside the area. An Austrian Study released in May 2005, showed that radiation from a cell phone tower at a distance of 80 meters causes significant changes of the electrical currents in the brains of test subjects. All test subjects indicated they felt unwell during the radiation and some reported being seriously ill. According to the scientists doing the study, this is the first worldwide proof of significant changes of the electrical currents in the brain, as measured by EEG, by a cell phone base station at a distance of 80 meters. Subjects reported symptoms such as buzzing in the head, tinnitus, palpitations of the heart, lightheadedness, anxiety, shortness of breath, nervousness, agitation, headache, heat sensation and depression. According to scientists this is the first proof that electrical circuits in the brain are significantly affected by a cell phone tower. The distance in this study was a mere 80 meters. Concerned about the effect that masts have on the nation’s firefighters, The International Association of Fire Fighters voted in 2004 to voice its opposition to cell phone towers and antennas being place on and around fire stations. They want proof first that there isn’t a safety issue and have asked for a moratorium on further construction and placement of any more towers or antennas on or around firehouses until such a study can be conducted. What Are These Antennas Doing To Our Kids While They’re In School?’t worth the risk. They should not be subjected to microwave radiation when science has proven there could clearly be devastating effects as outlined in the previously mentioned studies. School boards and parent organizations need to be aware of the inherent dangers from such an exposure. It’s been clearly shown that microwave radiation penetrates the head of a child much easier than that of an adult. This is due to the thinner and softer bones in the head of child. Skull bones don’t fully harden until about age 22. How Many Cell Phone Towers Are Near You? 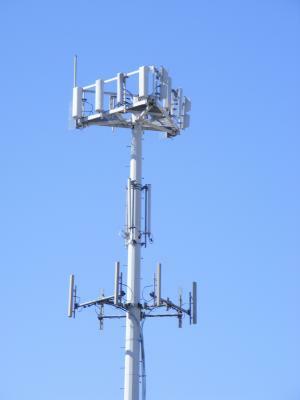 The average person lives within one-half mile of a cell phone tower. Have you ever wondered how close you live or work to one of these towers? Would it bother you if one were right in your backyard? How many of these towers and antennas do you think there are in your immediate area? Find out by visiting the website http://www.antennasearch.com/. Simply type in your address and you’ll get a listing and a map of all the towers and antennas within a short radius of your address. Like most people you’ll probably gasp when you see the numbers. These towers are literally everywhere. Hundreds and hundreds of them are probably located within a few miles of your home or office. The signal bars on your cell phone tell you how strong the signal is that are connecting to your cell phone. In other words, the closer you are to a cell phone tower the stronger the signal. The stronger the signal the less power your phone has to use to maintain the connection. A strong signal is indicated by a full set of “bars” showing on your cell phone display. Fewer bars mean a weaker signal. A weaker signal means the cell phone has to work harder to maintain the signal. Consequently, more power is needed to maintain the connection. The more power needed the greater the amount of radiation produced by your phone and the greater exposure to you. So always try to talk in outdoors or in an open space. This allows an easier connection from your cell phone to the nearest cell phone tower. Your phone won’t have to work as hard and less power is used to maintain the signal, which translates, to less radiation exposure for you. Obviously, can’t escape the exposure. We’ve established that fact. So what can we do to minimize the damage? Here are few ideas: We need to limit our exposure any way possible. Don’t live near a cell phone tower if you have a choice. Don’t buy a home near one even if the price is right. Limit your use of wireless devices. Go back to ‘wired’ connections whenever possible. Maximize your health through proper nutrition and good hydration. Eat foods high in antioxidants and take supplements. Eat organically as much as possible. There is no safe distance to locate away from a mast tower. Obviously, the closer to the tower the greater the exposure risk so do locate as far away as possible. Whenever possible encourage your local government officials to consider transitioning to the use of fiber optic cable. Most of it has already been laid underground. It’s just not being used. There are no masts with fiber optics and the small amount of radiation at the exits can be neutralized with technology now available. Discourage the use of Wi-Fi in schools by meeting with your school officials and school boards. Wi-Fi hotspots are popping up everywhere now. Even whole cities are going wireless with the installation of Wi-Fi. Again, it’s all done through a wireless signal, which is damaging to your health. Don’t let cell phone companies install cell phone antennas on the roofs of schools where your children attend. The radio waves are disruptive to their ability to focus, not to mention the health hazards we’ve already outlined. If you can’t change your current situation there is some hope. There are some intervention devices now available that you can use in your home, school and office to help lessen the risk of exposure. Some very good cutting-edge technology has been developed that will intervene and help mitigate the damage being done by wireless connections. There was big cellphone news out of San Francisco this week – and we’re not talking about the Wednesday launch of Apple’s latest must-have gadget, the iPhone 5. On Monday, the 9th U.S. 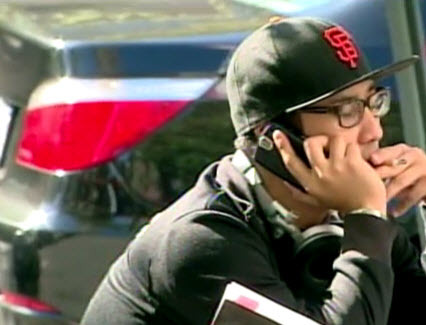 Circuit Court of Appeals, based in San Francisco, blocked the implementation of that city’s heavy-handed cellphone radiation warning law, pending the outcome of an industry challenge. This isn’t a case about medicine or Americans’ love of constant connection. It’s about whether the First Amendment protects businesses from engaging in nanny-state, government-ordered speech. The ordinance, believed to be the first of its kind in the nation, would require cellphone dealers to tell customers the devices may expose them to levels of radio-frequency emissions the World Health Organization classifies as potentially cancer-causing. Businesses would be required to prominently display an informational poster advising customers that the energy emitted by mobile phones is “”a possible carcinogen.”” Retailers also would have to provide customers with an information sheet and paste an informational sticker on all display literature, with all language scripted by the city. The wireless industry has vehemently contested the assertions contained in the health advisory, noting the World Health Organization issued a report in June 2011 concluding that no adverse health effects had been established as being caused by mobile phone use. All such portable communication devices certainly do emit radio-frequency radiation, at cumulative levels that differ from device to device. Those levels will be higher for people who never put their phones down. Users should seek independent data on potential health effects. But this case is primarily about “”compelled speech.”” In a friend of the court brief, the Virginia-based Rutherford Institute argues that retailers have a constitutional right not to be forced to speak for the government. As anyone who has looked at a cigarette pack or advertisement in recent decades could have predicted, the court agreed only in part, holding government-compelled speech must be “”purely factual and uncontroversial.”” The debate over the health risks posed by cellphones is far from settled. Those concerned about the possible health effects of electromagnetic radiation have plenty of ways to publicize their concerns. But if freedom of speech means anything, it certainly should forbid government from using the force of law to require anyone to speak out against his or her own interests and beliefs. San Francisco’s ordinance should be struck down before it can spread here or anywhere else. Microwave – and other forms of electromagnetic – radiation are major (but conveniently disregarded, ignored, and overlooked) factors in many modern unexplained disease states. Insomnia, anxiety, vision problems, swollen lymph, headaches, extreme thirst, night sweats, fatigue, memory and concentration problems, muscle pain, weakened immunity, allergies, heart problems, and intestinal disturbances are all symptoms found in a disease process originally described in the 1970s as Microwave Sickness. When the talented physician-author Servan-Schreiber wrote those prophetic words he was lucky. It had been 18 years since he had been diagnosed with a brain tumor incidental to an MRI. The book describing the anti-cancer program he developed had sold several million copies and may well have extended his life. Most brain tumors remain hidden and are only diagnosed after metastasizing into seizures or strokes. David’s luck ran out last year, when he died of a glioblastoma—spreading malignant tumor of the brain. Was it merely a coincidence that he had used one of his three cellphones held close to his head regularly for more than a decade before developing this fatal brain tumor? The WHO (World Health Organization) thinks not, having recently declared cellphone and other wireless radiation a “possible human carcinogen,” adding them to a list that includes some pesticides, engine exhausts and solvents. While we cannot be certain whether cellphone radiation may have promoted or caused the tumor that took his life, that is a highly plausible explanation. In America today, about 20 million children under the age of 14 have cellphones, and the CDC reports that one-fifth of all 2 year olds reportedly spend two hours a day in front of a screen. Increasingly, scientists and policy makers in tech-savvy nations like Israel and Finland are concerned that the ways these devices are used imperil the brain. The iPhone plastic baby rattle case protects the phone’s glass screen from cracking when dropped or chomped on by teething inquisitive babies, but does not protect the infant’s young brain from the phone’s pulsed digital microwave radiation. Cell phones have revolutionized the ability to carry out research and promote public health interventions. But, there’s growing recognition in technologically advanced nations that we need to get smarter about how we use these and other wireless devices. Fine print warnings that come with all smart phones today advise not keeping phones in the pocket or next to the body — advice that is typically ignored. 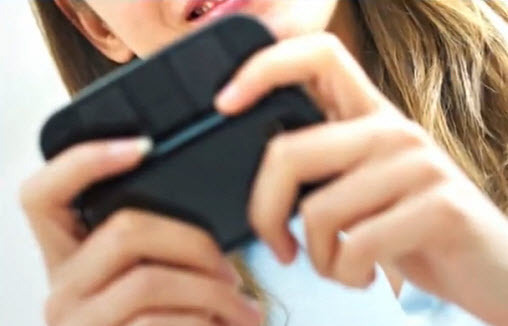 Growing numbers of national authorities, from Israel to France and Russia are making concerted efforts to promote awareness of the need to Practice Safe Phone. The proliferation of wireless gadgets overlooks a critical health issue: non-ionizing or microwave radiation at levels that do not induce measurable changes in temperature can change and damage the brain and sperm of experimental animals. A cellphone is a two-way microwave radio with intermittent and destabilizing pulses, unlike microwave ovens that steadily operate at the same frequencies at much greater power. The weak and erratic microwave radiation from cellphones and tablets cannot directly break the bonds that hold molecules together, but does disrupt DNA, weaken the brain’s protective barrier and release highly reactive and damaging free radicals. A 5 year old’s brain, healthy or otherwise, is encased in a thinner skull and contains more fluid than an adult brain. According to studies carried out by industry modelers in Switzerland and France, the bone marrow of a child’s head absorbs 10 times more radiation than an adult, while that of infants and toddlers will absorb even more. Few parents realize that infant apps such as One Fish Two Fish, Peekaboo Farm, and Twinkle Twinkle Little Star may do much more than amuse and distract babies. The American Academy of Pediatrics cautions that children need more real face time than screen time; more laps than apps. Most disconcerting are findings from Nesrin Seyhan, the NATO-supported founding chairman of the Biophysics Department at Gazi University in Ankara, Turkey, whose studies show that prenatally exposed rats and rabbits have fewer brain cells — and those that survive sustain more damage to their brains, livers, reproductive systems and eyes. Recent reports from Yale University’s chief of Obstetrics and Gynecology, Hugh Taylor found that prenatal exposures significantly increased hyperactive behavior in offspring. Other research carried out by National Institute of Drug Abuse Director Nora Volkow, MD, PhD, showed that exposures to cellphone radiation directly alters brain metabolism in human brain cells. Experimental work completed by American, Australian, Greek and Turkish teams working with experts in male reproductive health has reported that cellphone-radiation-exposed human sperm die three times faster, swim significantly more poorly, become more deformed and develop significantly more damage to sperm DNA. The brain cancer story remains complex, because the disease has a long latency up to four decades and because past uses and users differ radically from current ones. * When it comes to using electronic devices, remember: Distance is your friend. * Don’t hold a cell phone directly up to your head. Use a headset or speakerphone to talk on the phone, or a case (such as Pong) that has been independently tested to reduce radiation up to 90%. * Pregnant women should keep cell phones away from their abdomen and men who wish to become fathers should never keep phones on in their pocket. * Don’t allow children to play with or use your cell phone. Older children should use a headset or speakerphone when talking on a cell phone. * Do not text and drive, and use specially adapted antennas for cars to avoid absorbing maximum power as the phone moves from one cell system to another. * Turn off your wireless router at night to minimize exposure to radiation. * Eat green vegetables and get a good night’s sleep in a dark room to enhance natural repair of DNA that may have been damaged by radiation.